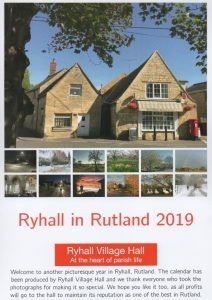 Our splendid village hall calendar for 2019 has almost sold out and we thank all those who bought one – or more – copies. It features exceptional photographs of local views and landmarks and attracted many favourable comments. The seasons are caught in all their beauty – a sharp Winter, the freshness of Spring, the vivid colours of summer with a glorious rainbow and the magnificence of Autumn in Ryhall. All profits from the calendar, which was priced at £5, will go to the hall, a registered charity. We thank the Village Stores, Ryhall, for their help in promoting and selling the calendar and so supporting our vital fund-raising.